Why continue to spend money on advertising and marketing that doesn’t work. Take the shortcut – invest in the RIGHT information to grow your business and reap the rewards of more leads, customers and sales. Marketing for the 21st Century. By Kinetic Media & Marketing. 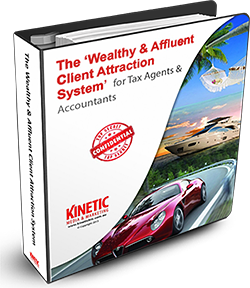 The ‘Wealthy & Affluent Client Attraction System’ is the ONLY marketing system available in Australia tailored to tax agents and accountants. It’s written in an easy-to-follow format for people who want results, not to be educated about the basics of marketing. Big corporate clients will generate substantial sales revenue, income and profit for your company. But how do you get their attention? What are the best ways to communicate and educate those high-value prospects in order to win new sales? The solution is the Kinetic ‘Big Client Attraction System’ specifically developed to utilise modern professional marketing methods. How to get through the multiple levels of gatekeepers – and even have them ensure that the key decision maker gets your message! How to educate your prospects so they know what you offer and the important benefits! When and how often you should communicate with these important prospects for the best results. Want to really make an impact with a prospect? Learn the best, lowest cost (and the most professional) way to do this. The ultimate secret to getting new BIG clients calling you to make a time to meet! Each BIG client would be worth $50,000, $100,000 or even $200,000 to your company in orders and repeat sales PER year. What would you be willing to invest to add a million dollars in revenue to your company in the next 12-24 months?